The leaves are falling and so are Turkey’s worst enemy in our Fall Fling contest where you get to slingshot Raccoons away from the Turkeys! But don’t worry, no animals harmed here. Get a chance to learn about the wildlife we have around the park. Take the family outside in the fresh air and compete against other families in the Thanksgiving Feast Scavenger Hunt around the park. Feeling stuffed after that, then come and relax while the kids can play fun games like Stuff the Turkey Contest and the Turkey Baster Relay! If you brought your best Gobbles, then sign up for the First Annual Gobble Contest to see who’s the best Turkey out there. After everyone is gobbled out take the family out and enjoy a ride on our “Spot the Turkeys” Hey, Hey, Hey Ride or have a break while the kiddos take a ride on the “Gobble while you Wobble” “Bear-roll” Train Ride. Feeling lucky? Bring the family to the Bears Den so you can support your favorite flightless bird in our Turkey Trot Races for a chance to win a “turkey-tastic” prize! Yogi BearTM and Friends are “Beary-Thankful” families get to camp with us, and more importantly, bringing pic-a-nic baskets full of Gobblin’ Good food! • “Hey, Hey, Hey Rides” -Guests of all ages enjoy this adventurous ride through our resort! The ride goes along with the theme of the week. • Arts & Crafts – Make your own souvenir, paint a ceramic, get a glitter tattoo, or, make a tie-dye shirt, just to name a few options. • Family Dance Party – A new way to experience the kind of wholesome family time under the stars which can only be experienced here. • Paintball and Laser tag – An excellent test of skill and loads of outdoor fun. •“Bear-Roll” Train Rides – A huge hit with our little campers, plus a bear will meet you there to give a big send-off. See all of the Fun Options available during your getaway with us. NOTE: This is a WEEK LONG THEME FOR THE HOLIDAY BREAK NOVEMBER 16-25.
downloading our “New” App. 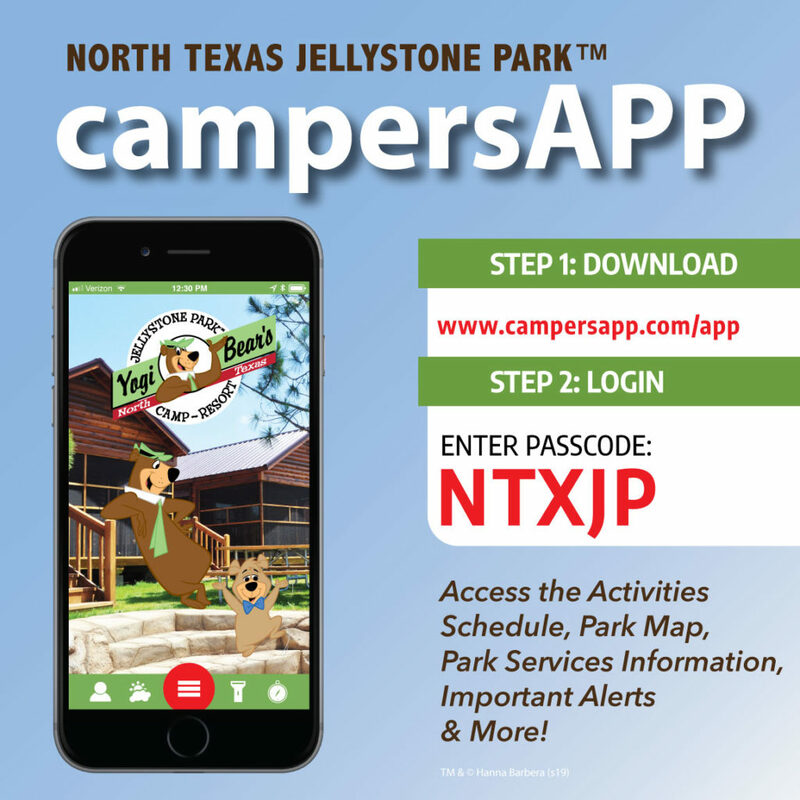 Just click on the icon below and Login with NTXJP. a fun site for kids!